Hey all! I apologize for my absence lately, school was keeping me busy and on top of that I managed to injure myself in the most peaceful of workouts: yoga; but now I’m back, feeling good and ready to post again. I don’t know if any of you remember around the end of 2014 when I wrote that I wanted to introduce cakes to the blog and lean more into harder aspects of baking while still doing my fun little baking post, well today I’m finally giving you that cake post and what a cake it is. 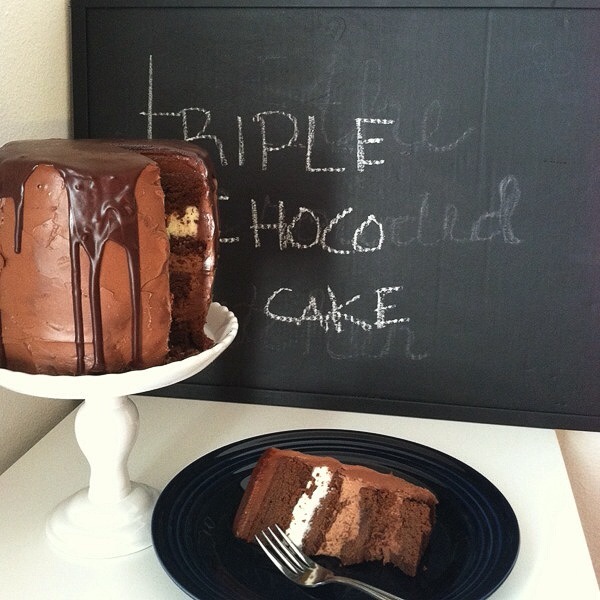 This post screams so much chocolate that you probably had to drink some milk to help unclog your mouth to scream it! Behind the Scenes (BTS): the reason I ever even made this cake was my aunt’s birthday. She’s very crafty and loves to bake just like me and tells everyone she knows that I should have been her daughter and trust I’ll take the compliment. She wanted a special party for her 52nd and I told her I would supply the cake, oddly enough that’s when I pulled a rib muscle, strained a lung and could barely move for days, but thankfully by the time I had to start making her cake I could move around a bit. This cake in all actuality only takes anywhere from 4 to 5 hours including cool downs, ganache setting up and all that jazz, but if your feeling lazy you could definitely hold off some of those things for the next day like I did to not overwork my upper midsection. When it came to the conception of the cake I used my uber awesome Christmas gift that my always wonderful mother got me: Linda Lomelino from Call Me Cupcake’s cake cookbook Lomelino Cakes. In her book she has a cake similar to this but instead of a mousse it’s solely a ganache filling. I really liked the idea of the cake and one day plan to make it exactly like it is in the book but I wanted to try something different that way my aunt would know I actually put some thought effort into it. Adjustments: Believe it or not I haven’t made a mousse since I was around 18. It’s not that I have any bad feelings towards mousse, I just don’t really use it in my baking. I guess I feel like while I’m young and still have all my teeth I should use them and mousse makes me feel like I’m back in those days of smooth baby food (like I even remember those days anyway); but since the cake portion was going to be very sturdy I found it necessary to not make the filling sturdy but soft that way there would be a variety of textures that would work smoothly and once combined give each texture a compliment to either soften it or firm it up. 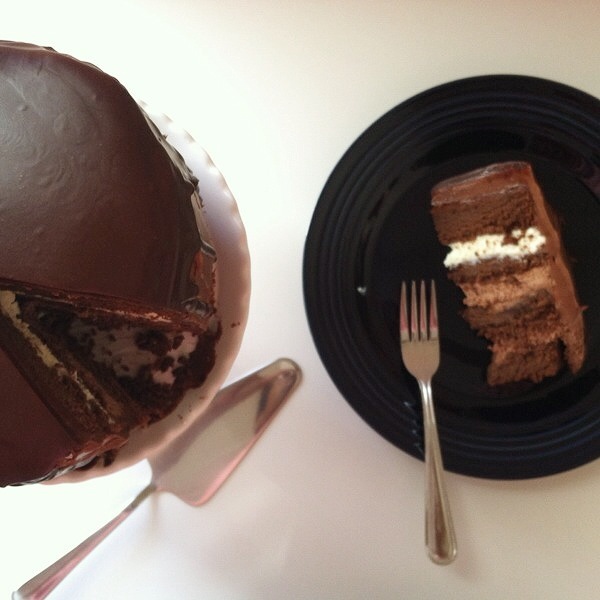 Mousse: When it came to the mousse I made a very thick mousse; there’s only two ingredients in the mousse: heavy cream and chocolate; I didn’t want a soupy mousse to wet up the cake and I felt that a sturdy mousse would also hold up the weight of the cake. I would suggest when your whipping your heavy cream to whip it until it’s just about to become butter. You want it thick and when you move your hand mixer from that section of the bowl for the cream to stay where you left it, not to run down even though it’s a whipped cream. It also helps to chill the bowl as well. You’ll also notice in the recipe section that the amount of heavy cream differs for each chocolate. Darker chocolate doesn’t have as much sugar and cocoa butter as milk chocolate and if we’re being technical white chocolate isn’t even chocolate; it consist of cocoa butter, sugar and milk solids. Because of these ingredients those chocolates are softer than the dark chocolate and take less heavy cream to melt them and turn into a ganache. I heavily suggest not heating up all you heavy cream together and to do it in separate bowls or cups at the same time. The Cake: I love and I repeat LOVE this cake. It screams chocolate but thankfully it doesn’t have that coin sweetness since i used bittersweet chocolate to offset the amount of sugar and butter necessary to make it more pound cake rather than fluffy cake and the taste of the cake is awesome as well because it reminds me of a brownie. Note: This is also a fairly small cake, 6 inches/15.4 cm, which is too adorable and just enough to feed a small amount of people; although there were 18 people at my aunt’s party and she managed to cut the cake to where everyone got a piece, a slicing magician that woman is! 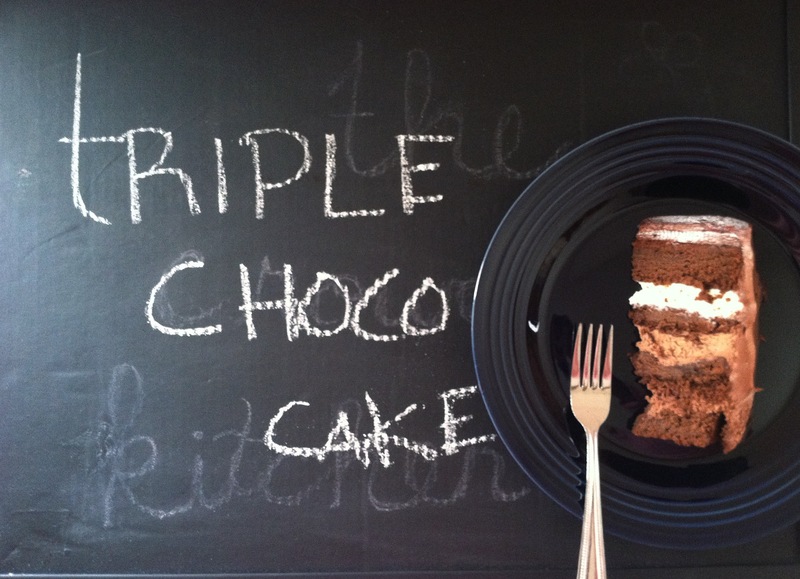 Frosting: I’ve tried this cake with two frosting recipes. One was a chocolate marshmallow frosting which in my opinion made it too sweet and the other was a cream cheese chocolate frosting (the one you see in these pictures) and that was better in my opinion. Both recipes will be available below just in case you hate cream cheese or believe the marshmallow frosting would indeed be too much for your teeth and taste buds. Aspen Dental already takes too much of my money anyway. Can I get a social media AMEN! Alterations: If this much chocolate is just too much for you then you could either half the mousse recipe,filling it slightly or you can only use white chocolate mousse to fill your cake which will cut down the heavy chocolate taste. 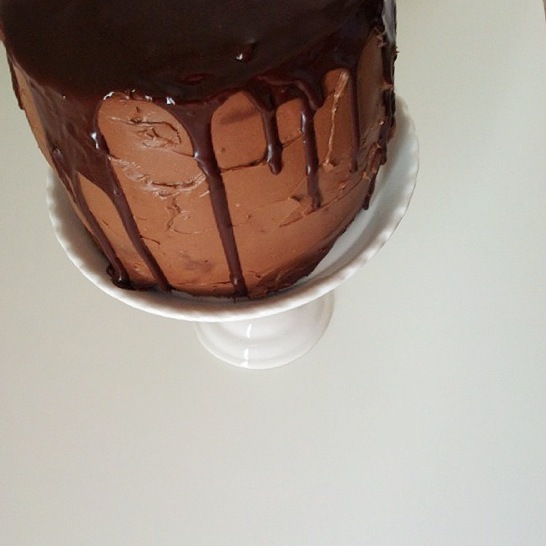 And if mousse isn’t your thing either you could use the ganache of the mousse recipe, whip it with your hand mixer to make it fluffy and smooth, and this will still lighten up the texture of the entire cake. 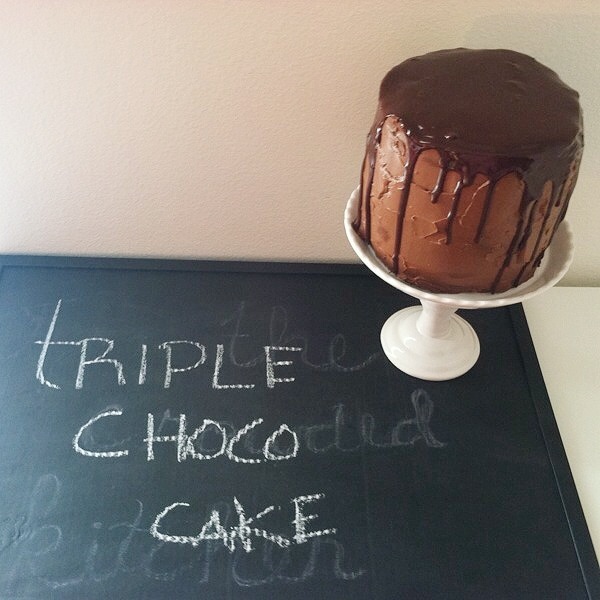 Helpful Hints and Suggestions: One of the most trying things for me when it came to this cake was having it stand evenly tall, it would always slant and I realized that this was because I didn’t give the mousse ample time to set. This is a must. I recommend chilling the mousse in the fridge before assembling the cake. You could let it chill while your cake cools or while you make your frosting, but it does need to chill out. Another hint I would give you is to make sure your ganache is thick before you turn it into a mousse, if you feel that using all the ganache you’ve made will make the mousse less thick then don’t use all of it and turn the rest into a fancy truffle which would be an amazing topper on the cake anyway, but you desperately want your mousse thick to handle the weight of such a sturdy cake. A cake suggestion I would give is when your slicing the cake in half horizontally to also slice off what ever dome that rises on top of the cake, this may have happened in the baking process, but to take all caution to stop it from happening I would say even out the batter and to tap the pan filled with batter a few times to make sure there are no air pockets in the batter before putting it in the oven. I would also suggest making sure there is an even amount of batter in each pan, I used a large cookie scoop to make sure there was the same amount of cake in each one, I’m also neurotic and a glutton for punishment when it comes to tedious things, but if you were wondering it took about 9 large cookie scoops each when I did it. Storage: this cake is perfectly fine in the fridge for at least a week. In fact right until 15 minutes before your about to eat this cake keep it in the fridge, so many of the components of the cake require constant coolness that letting it get warm will be a disaster, it may still taste yummy but a bit soggy and we already had the teeth discussion. Additions: There aren’t many things I could think to add to this recipe. If you wanted to add liquor I would suggest bourbon, if you wanted to add a fruit I would suggest banana and if you wanted to add a nut I would lean more towards peanuts. They all compliment the nutty woodsy flavor of chocolate. If your going to use bourbon I would say use 1/4 cup/ 2 oz. in the cake batter and about a 1 tablespoon/0.5 oz. in the mousse subtracting that tablespoon from the heavy cream; and for the banana you could either add it to the batter (1 whole small banana) or to the ganache (1 whole small banana divided) I would say to cook it down and let the extra liquids cook out then add the heavy cream to it and let them infuse on the stove into each other and thicken up; this takes about 10-15 minutes. 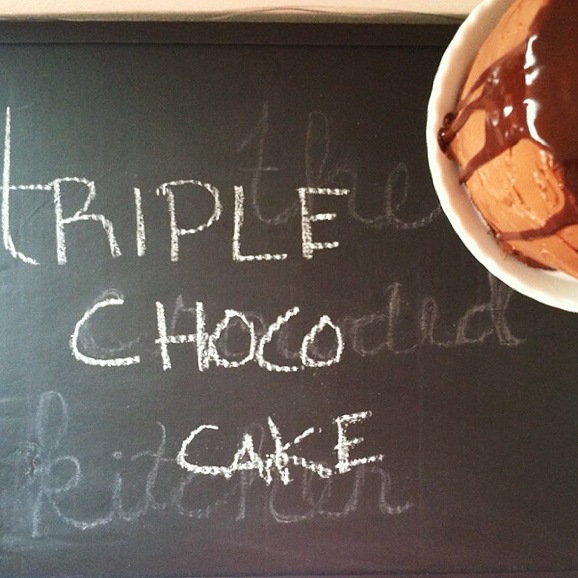 Ta-Ta-For-Now: Well I hope you all like this recipe. Another cake recipe post isn’t too far away either since one of my roommate’s birthday is in a couple weeks and she’s already requested a cake I’ve done before. I hope you all have a safe and happy day! Enjoy! The first thing you want to do is measure out all of your ingredients. Start the process by adding your hot water to your chocolate chips, then in a separate large metal bowl cream together your butter and sugar, once fluffy add your sifted cocoa powder followed by your melted chocolate mixture. Once all are fully combined add your flour/salt and eggs alternately. Once the batter is made let it rest for about 20 minutes, use this time to spray your 6 inch/15.4 cm cake pans and start on your mousse. When your 20 minutes are up, evenly measure out the batter into your cake pans, I used a large cookie scoop and it took about 9 scoops in each pan. Even out the batter and tap on the countertop a few times to let out any possible air bubbles. Put it in your 350F/176 C oven for around 45 minutes to an hour. Once done let the cake cool down completely before removing it from the pan. Once it’s from the pan let it cool down completely before cutting layers. I used a cake cutter to do this as I rarely ever get a clean cut with the knives I have, and it cost around $10 USD from JoAnns, you can get it anywhere else, from Wal-Mart to Hobby Lobby to Target. If you’re comfortable with your carving skills then use a serrated knife to cut the cake horizontally, since the cake should be about 2 inches/5 cm in depth you could use a ruler and cut at 1 inch/2.5 cm. In order to save time, dishes and energy this whole process does not need to be done on a stove, but I would suggest making each on separate to make sure the right amount of heavy cream is in each chocolate. Measure out each chocolate and put them in separate small bowls, in three small bowls or cups put in 1/3 c. heavy cream for the dark chocolate, 1/4 c. for the milk and white chocolate respectively. You can heat up the heavy cream in the microwave and it takes up to two minutes total. Check on the heavy cream after about a minute and 30 seconds. Put the heavy cream in each bowl of chocolate; let it sit for about 3 to 5 minutes then in the center of the bowl stir with a spoon gently until fully incorporated. This will lower down on the air bubbles in the ganache. Let it sit for about 30-45 minutes and thicken up. In a chill metal bowl, separately, whip the remaining heavy cream into a thick whipped cream; you want it to be as thick as possible before it becomes butter. For me this takes less than 3 minutes but for my mom who uses a stand mixer this can take upward of 5 to 10 minutes depending on the speed you use. Once your cream has been whipped add a little to the ganache the remaining heavy cream was part of. Once the ganache has become less thick add the mixture to the rest of the whipped cream and TADA! You have mousse. Put the mousse in a small Tupperware bowl and put it in the fridge to chill and thicken up. Do this again to the rest of your ganache. In a large metal heat safe bowl combine your sugar, water, salt and egg whites and put it over a boiler sauce pan. Make sure that the water does not touch the bowl. With a whisk constantly stir your mixture until all the sugar has fully dissolved. Rub the mixture in-between your fingers to make sure. Add the cocoa powder and melted chocolate to the marshmallow frosting; make sure all ingredients are fully combined and set aside. In a large bowl add your softened butter and softened cream cheese, vanilla paste and heavy cream; mix with your hand mixer until all are fluffy and completely incorporated with each other. Add your melted chocolate and sifted cocoa powder and mix one more time. Make sure to go through with a spatula to make sure everything is evenly incorporate. Mix in your powdered sugar, give it one more stir with your spatula and set aside. In this case it might be easy to create this cake in a cake pan, cover the cake pan in plastic wrap and put one layer (there should be four total) of cake at the bottom. First add your dark chocolate mousse, make sure it is evenly spread and add another cake layer, follow this by adding your milk chocolate mousse and once again follow this by evenly out the mousse and putting the 3rd cake layer on top, do this again with your white chocolate mousse, evening it out and add the final layer of cake. I found it helpful to put another cake pan wrapped in plastic wrap over the top of the cake like a little hat. Put the cake in the fridge for about 30 minutes to 1 hour. 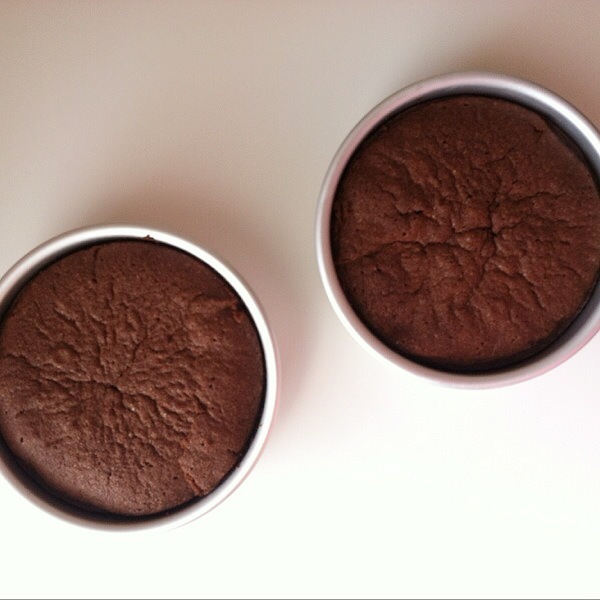 When the cake has chilled, take it out of the cake pan and proceed to frost it with the frosting of your choosing. Once again put the cake in the fridge this time to let the frosting harden up. This time it only needs to be in the fridge for about 15 to 30 minutes. In a small bowl make your chocolate sauce drizzle. Put both your butter and your chocolate chips in the bowl; put it in the microwave for about 15 to 20 seconds until the butter is fully melted. Mix it until fully incorporated and until the chocolate has fully melted. 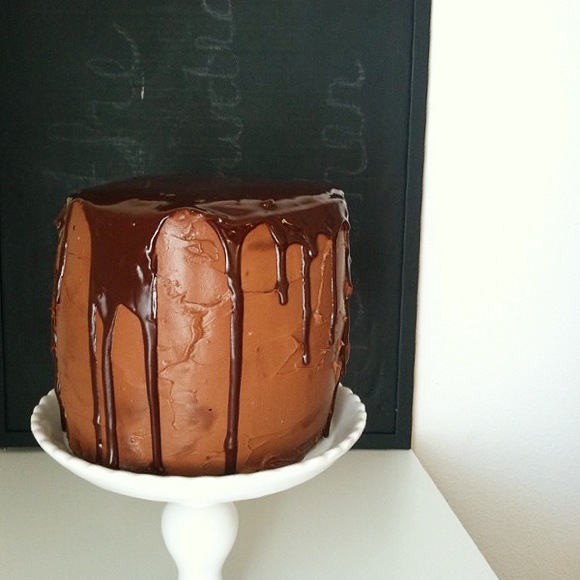 Take your cake out of the fridge and proceed to drizzle the chocolate sauce in any way you choose. The way it’s done in the pictures was I poured it from the middle of the cake and helped poured a little bit extra on the sides that hadn’t fallen onto the side of the cake yet. It taken about 3 minutes for the sauce to harden up onto the cake. 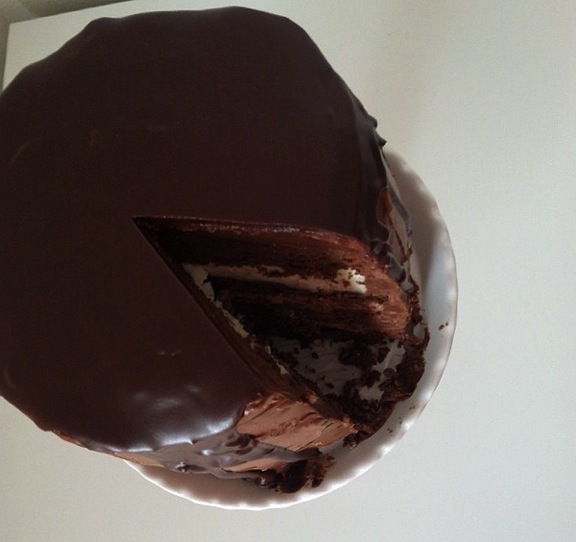 From here you can eat the cake right away or leave it in the fridge until it’s time for it to be eaten. 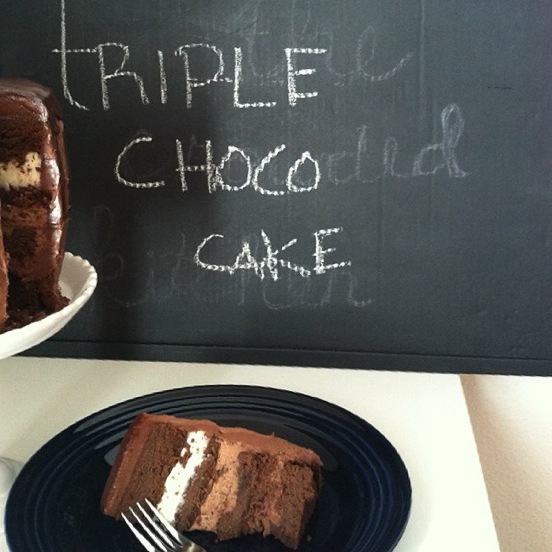 This cake last about a week in the fridge and only gets tastier day by day.